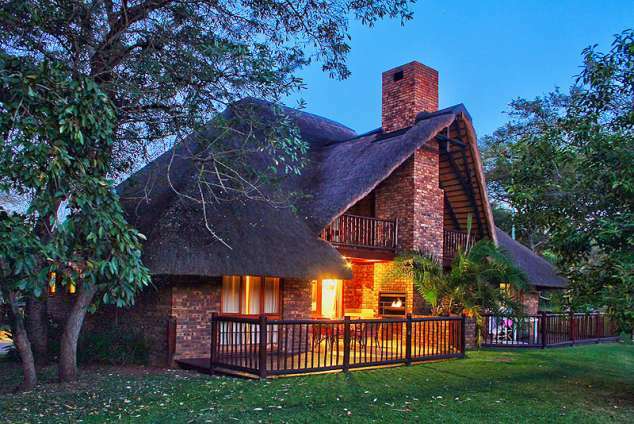 Cambalala - Kruger Park Lodge - Hazyview Accommodation. Sleeps a maximum of 6 adults and 2 children. - A daily cleaning service is included. Our 3 privately owned self catering lodges are set in the award winning 4 star wildlife & golf resort of Kruger Park Lodge - South Africa. Within easy access of the Kruger National park and scenic sights of the Blyde River Canyon..
Cambalala - meaning "relax" in Zulu - is located in Hazyview, South Africa within the award winning 4 Star golf and wildlife resort of Kruger Park Lodge, which is a luxurious resort on the banks of the Sabie River in Mpumalanga. The chalet is nestled serenely in a quiet part of the resort. Away from main thoroughfare traffic and flying golf balls, but still only just a few steps from all the action. There is abundant birdlife, free roaming Impala and other animals all around. Cambalalas units are spacious chalets which sleeps up to 6 adults and 2 children. Each house has 3 spacious air-conditioned bedrooms. Downstairs is an en-suite double room and a semi-ensuite twin room. Upstairs is a large, light and airy loft area which sleeps 4 on two single beds and a bunk bed. All rooms have fitted double wardrobes, dressing tables with mirrors and hairdryers. The loft has a 2-seater sofa, bean bags and flat screen TV, which makes it an ideal separate living area for the kids. There is also a handmade wooden cot for the very little. All bedrooms have ceiling fans in addition to air-conditioning. Linen and towels are provided. The lounge, with the dining area to the rear, has direct access to the outside entertainment area, which is where you'll probably spend most of your time when you're not out on Safari. There is 1 three-seater sofa, 1 two-seater sofa, 1 arm chair and a coffee table for your comfort. The flat-screen television is housed in a cabinet and French doors open out onto the decking. The dining area has a 6-seater wooden table. The fully equipped kitchen houses everything you would expect: an oven and hob with extractor fan, washer/dryer, large fridge-freezer, microwave, toaster, kettle, etc. With plenty storage space and granite work surfaces throughout. The wooden-decked entertainment area outside is the perfect spot to spend an afternoon reading a book or an evening cooking and recounting your adventures of the day. Like any truly South African abode Cambalala is equipped with a large built-in braai (barbeque) with storage and work surfaces to cater for all your al-fresco eating needs. Alternatively, there are many great restaurants in the area including the one in the Kruger Park Lodge resort itself. Only 10km from the Kruger national park. There is a plethora of activities to enjoy in this beautiful part of South Africa. This is a convenient location from which to explore the whole area and many of the beautiful scenic attractions Mpumalanga has to offer, including the Blyde River Canyon, God's Window, Pilgrim's Rest, Three Rondawels, Pinacle rock and many others. Whether you're an adrenaline junkie, wildlife and bird enthusiast, keen golfer or just after a get-away-from-it-all holiday, Cambalala and Kruger Park Lodge has something to offer the whole family. Spend the afternoon on our local golf course, go on a safari game drive in the nearby world-renowned Kruger National Park, or relax on the grass overlooking the hippo dam and admire the unique African sunset whilst listening to local birdsong. For the thrill seekers, the dramatic landscape offers an abundance of activities to get your adrenaline going. Experience the South African way of life with a touch of class and come and enjoy a relaxing break at our guesthouse. Cambalala sleeps up to 8 guests comfortably. Our guests also qualify for heavily discounted rates at the nearby Sabi River Sun golf course which is one of the finest courses in South Africa. 37722 page views since 18 Jul, 2008. Last updated on 04 Oct, 2018.